The PLC Toolkit contains all of the tools educators need to transform their schools into dynamic and successful PLCs. 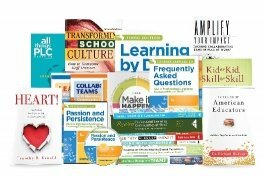 Curated by world-renowned PLC experts, this package of self-guided professional development includes thirteen books, five DVDs, and a subscription to AllThingsPLC Magazine. Easy-to-follow facilitator’s guides and dozens of reproducibles help leaders translate the video resources into powerful workshops. Explore the core principles of the PLC concept, and understand how PLCs improve student learning. Gain clear insights into what distinguishes a PLC from a traditional school, and learn how to transition from a traditional school to a PLC. Discover proven practices for how to work together in teams, and explore how to build and sustain excitement and commitment to the PLC mission. Learn through real-life examples from educators who have implemented the PLC concept in diverse schools. Translate critical PLC concepts into lesson plans that focus on learning.